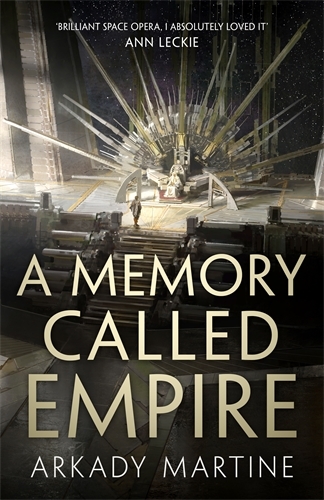 Akaday Martine’s debut novel A Memory Called Empire continues a strong emerging tradition of modern space opera. These are stories less concerned with action and space battles than with cultural understanding, personal connections and political manoeuvring. They are science fiction that is focussed on characters and the relationships between them but do not shy away from the potential wonders of strange new civilisations, different cultures and versions of humanity. They are epitomised by the works of the likes of Iain Banks, Becky Chambers, Ann Leckie and Yoon Ha Lee. Mahit Dzmare is the new ambassador from the tiny but independent Lsel Station to the mighty, galaxy spanning Teixcalaan Empire. She is like the country mouse visiting the city – a long time student of the Empire, its language and its culture, she is still awed by its central, planet-spanning City. Mahit arrives to find that her predecessor is dead, possible murdered. She is supposed to be helped in her task by his memories, implanted in her mind in a process that allows for the seamless continuation of Lsel knowledge. But the memories she has are fifteen years old and even these are corrupted, leaving her alone and out of her depth. Mahit (and the reader to some extent) is helped in her struggles to understand this society by cultural liaison Three Seagrass and her friend Twelve Azalea (all Teixcalaani are named with a number and a noun). Mahit is put in increasingly difficult situations as she tries to navigate not only representing her own little pseudo-world but also a fracturing political situation locally. To say much more about the plot would take away from the pleasures and surprises of this assured debut. Martine conveys a deep understanding of her constructed civilisation which she manages to reveal through the narrative and action. But she also, as science fiction and particularly this form of space opera is want to do, dabbles in questions of what it means to be human, the exercise of power, and how we define “civilisation”. Despite a lack of major space opera pyrotechnics, Martine builds to a tense and emotional conclusion which makes sense in the universe she has built. While it works perfectly as a standalone, A Memory Called Empire is reportedly the first book in a series. Given where her characters and their milieu are left it will be fascinating to see where Martine goes next.